You might want to make sure your students can only play the game you want them to play on the lesson you're having, or as a homework. You can do that on TeacherGaming Desk! As a teacher you can restrict the access to games for each of your classes. 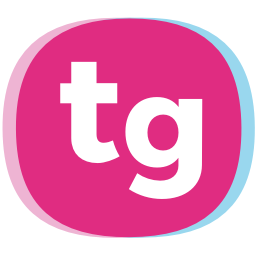 You can manage the games your students are able to launch through TeacherGaming App. For now this is a beta feature, and to work it requires the version 1.1.6 of the Student App. Here's how it's done. 1. Select the class. Start managing the class you want to set the restriction for. On the top of the Desk page click on Manage Class, select the class and click on Manage. 2. Set the game restricting on. Just below the class sharing, there's a switch Restrict access to games. Set the switch on. 3. Allow your students to play only the game of the ongoing lesson. If your class is allowed to play 0 games, they're only allowed to play the game of a lesson you're having. If you don't have an ongoing lesson, they won't be able to launch any game through the TeacherGaming App. 4. Or select up to 5 games your students can play. 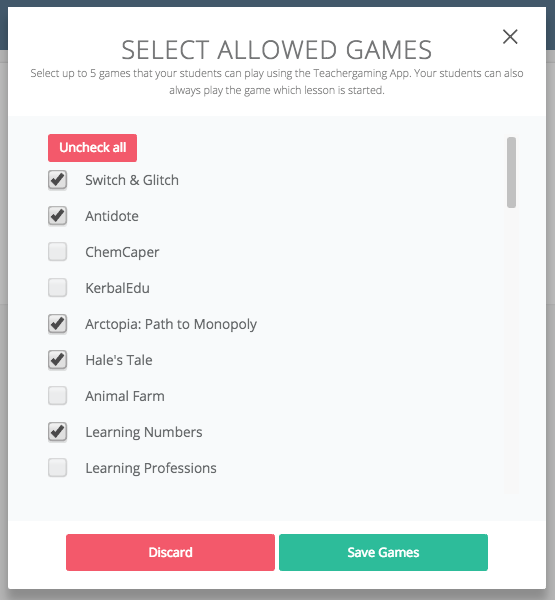 You can additionally select up to 5 games your students can play through the TeacherGaming App. Click on the Manage (next to the Class allowed to play 0 games). Select the games you want your students to see, and click on Save Games. 5. Set the restriction off. You can always set the game restriction off if you want to allow your students to play all the games.